Call us at 1-866-898-4805 or email us at buybacks@silver.com to receive custom bid pricing for this item. Note that buybacks are subject to $1,000 minimums as well as possible maximums depending on inventory positions, and require verbal confirmation via phone. Any quantity only $89.99 per oz over spot! The Shengxiao Series from the Royal Mint in Great Britain enters its third year of production with an exciting new design honoring the Year of the Monkey. Created in celebration of the Chinese Lunar Calendar, the latest design adds to the beauty and impressive quality of the Royal Mint’s own take on Lunar Series products. Today, the 2016 1 oz Gold British Monkey Coin is available on Silver.com. Ships to you in an individual plastic flip, Mint tube of 10, or Monster Box of 100. Consists of one troy ounce of .9999 fine gold. 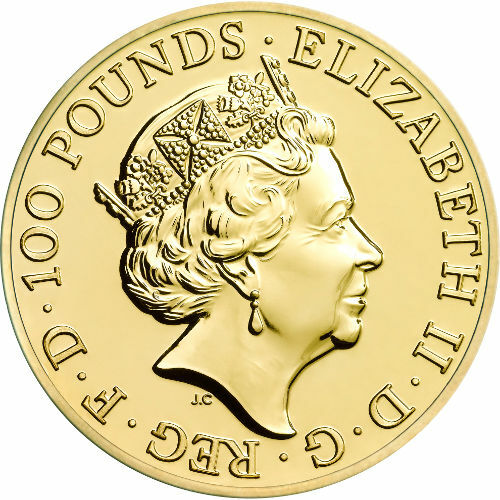 Face value of £100 (GBP) is fully backed by the United Kingdom. Part of the Shengxiao Series. Celebrates the Year of the Monkey. Available in Brilliant Uncirculated condition. The Royal Mint’s Year of the Monkey coin, and all Shengxiao Series coins, are designed by British-Chinese citizen and artist Wuon-Gean Ho. On the obverse of the coins is the latest update to Queen Elizabeth II’s right-profile portrait. Britain’s longest-reigning monarch has had her likeness updated for a fifth time since ascending to the thrown in 1952. Previous updates included 1968, 1985, and the popular 1998 design from Ian Rank-Broadley. 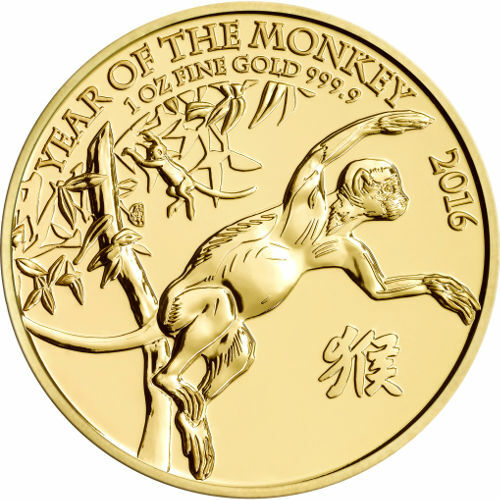 On the reverse of each coin is the Year of the Monkey design from the Royal Mint. In it, a pair of monkey is visible dangling and swinging amongst the trees. In the background, one monkey is visible dangling while a monkey in the foreground prepares to leap from one branch to the next. The obverse features the all-new portrait of Queen Elizabeth II. Designed by Jody Clark, who was just 33 years old when the design was accepted, the new image depicts Her Majesty as she would appear at this point in her life. Each coin available through Silver.com is in Brilliant Uncirculated condition. BU coins have no signs of wear and tear, but may exhibit breaks in the luster or contact marks from the production process. Please feel free to contact Silver.com with questions at 888-989-7223, online using our live chat, or via email. If you are looking for similar products, be sure to check out our full selection of British Gold Coins. Images shown are examples only. Actual item appearance is subject to change, but will always correlate with title and description. From where will my order ship? What if my order is lost or stolen in transit? Where does your spot price come from? Are your products actually in stock? Why are multiple prices listed? When do I lock in my price?